The rookery was practically teeming with osprey. They make their nests on top of the channel marker signs, and boats can cruise by them and even stop at a respectful distance to observe them. There were generally two juveniles in each nest we passed, waiting on a parent to come by with a meal. Audio: Feed me, feed me! 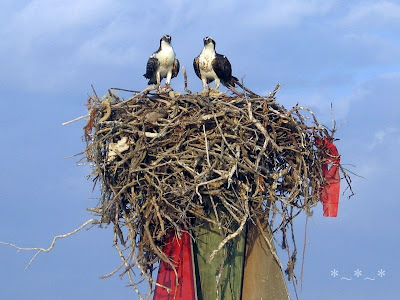 The exception was a beautiful, regal pair that Carol said had been nesting there for years, and a parent watching from a distance as the offspring practiced his “mantling” behavior over a meal in the nest. This is one of those “OMG!” shots that you don’t know how good it is until you get it home and up on the computer screen. It’s the pair of osprey that have been nesting there for a while. Audio: Describing the appearance of the Osprey. Osprey “mantling” his food; another, probably the parent, observes from a tree in the background. 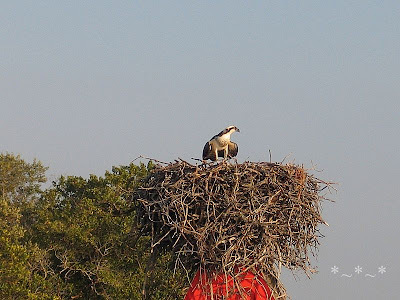 Visual: Osprey in the nest eating. Dr. Jackson talked about DDT poisoning and how it nearly destroyed the osprey population. He said that DDT lasts FOREVER in the body of invertebrates; it gets stored in fatty tissue, the brain and the liver. A sudden dramatic weight loss can release the poison into the system and cause all sorts of serious problems. Audio: SW Florida, mercury pollution, talking about osprey’s coloring, etc. This one is a very good length. NEXT TIME: Sunset on Rookery Bay! Previous PostSunset Cruise on Rookery Bay, Part 3Next PostSunset Cruise on Rookery Bay, Final Chapter! You are so right that that one pic is an OMG shot! This is a terrific set of blog posts Tink – well done! Thanks for visiting the other day…sorry I’m late getting backatcha…been a busy week. Sorry everyone – it looks like YouTube is down at the moment, so the videos aren’t showing up. I hope you’ll come back later or tomorrow to check them out. 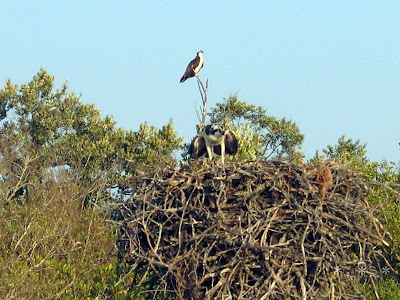 I just loved seeing and hearing all the osprey in Rookery Bay, and so wanted to share it with you all! That truly is an “OMG” shot ! Great pics here and a wonderful write up too.